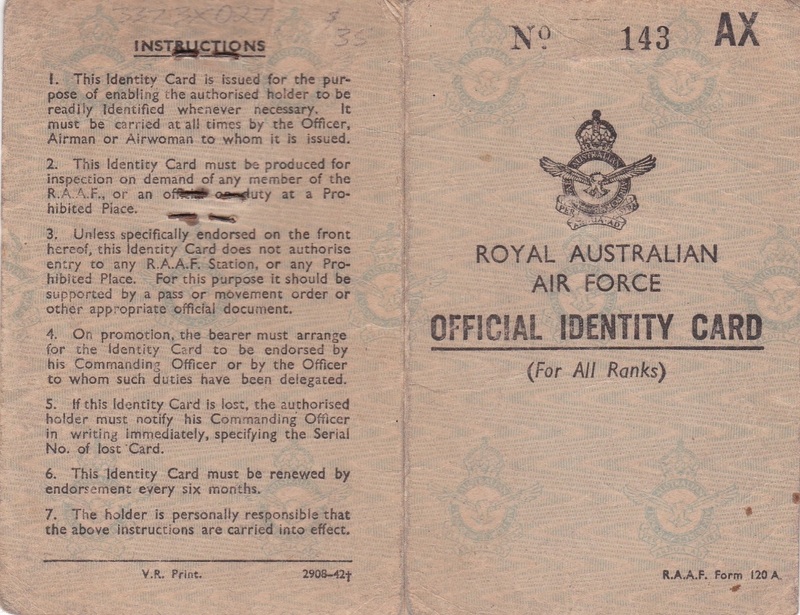 D040. 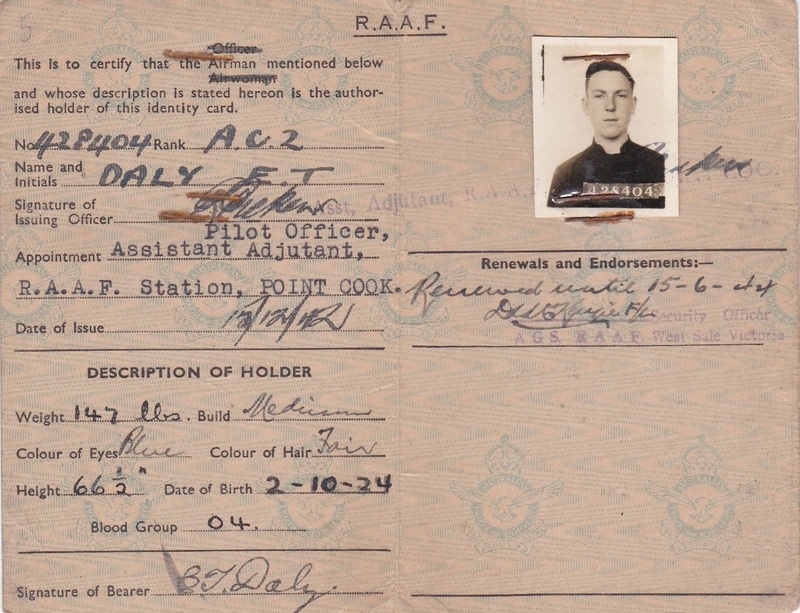 An Official Identity Card named to 428404 Daly E. T. Edgar Terence Daly enlisted on 13 Oct 1942 at Melbourne and discharged on 11 Mar 1946 from 9 Aircrew Holding Unit with the rank of Warrant Officer. D049. 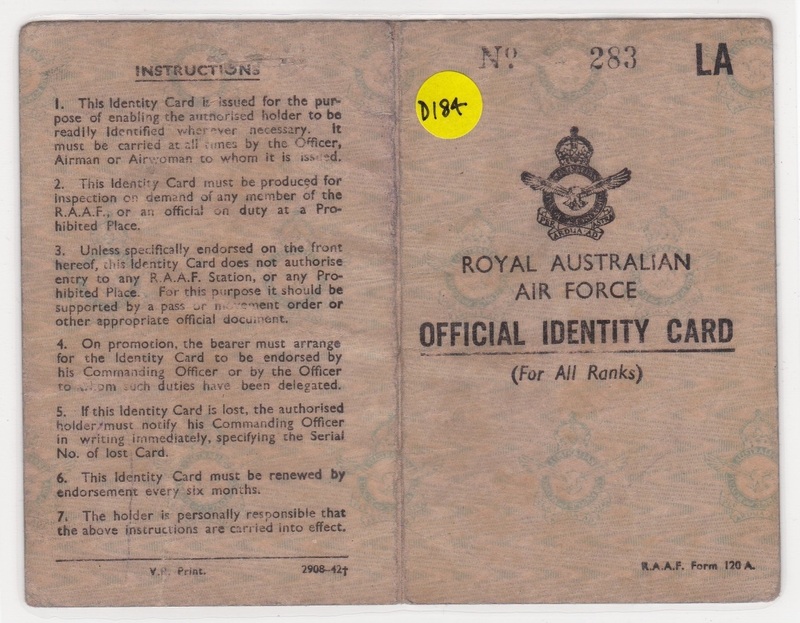 An Official RAF Identity Card named to 251628 S/LDR Arthur Lawrence Hall. 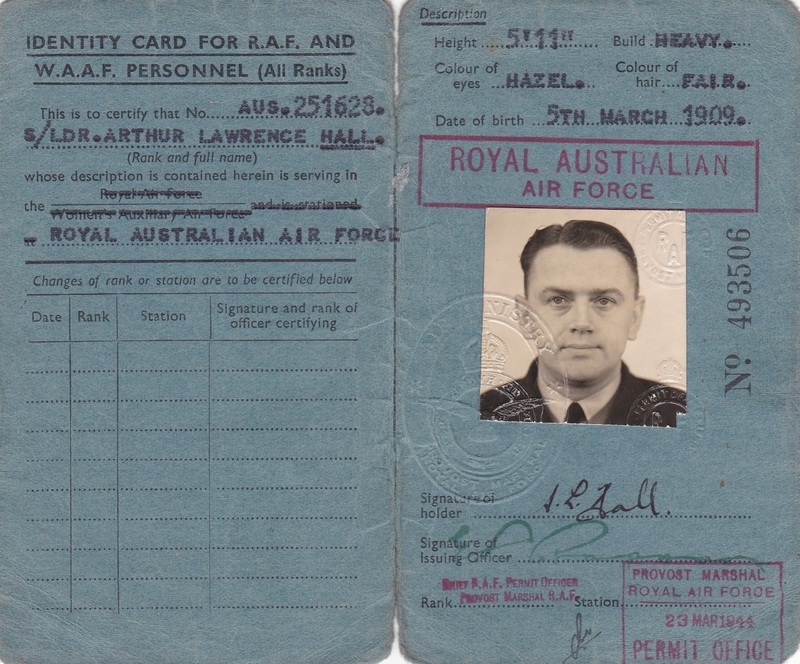 Arthur enlisted on 12 Aug 1940 at Ascot Vale and discharged on 17 Oct 1945 from RAAF RAD 5 with the rank of Squadron Leader. D122. 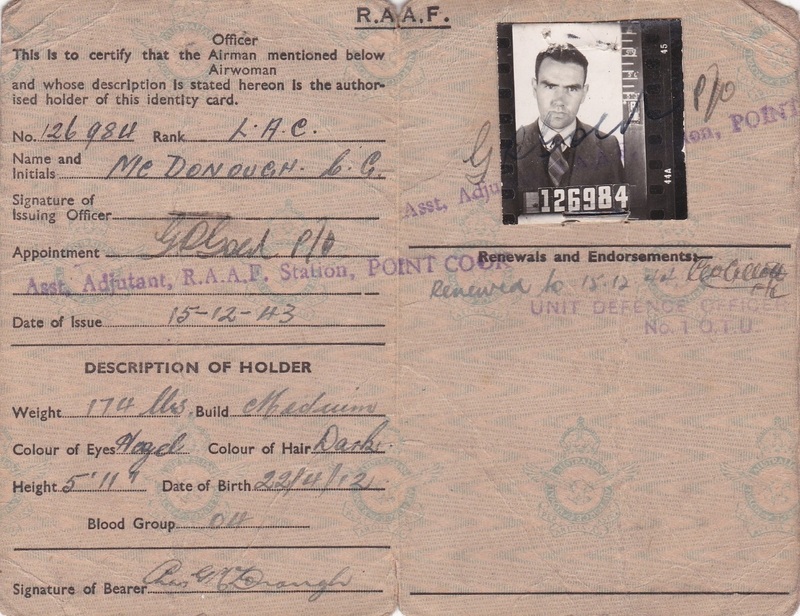 An Official RAF Identity Card named to 424967 Keith Neville Chadwick. 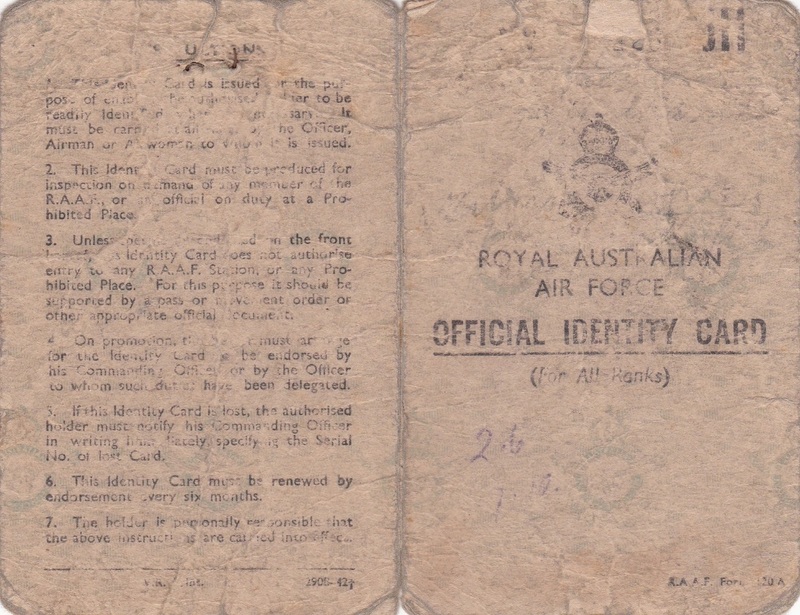 Keith enlisted on 10 Oct 1942 at Sydney and discharged on 31 Jan 1946 from 11 Aircrew Holding Unit with the rank of Flying Officer. D146. 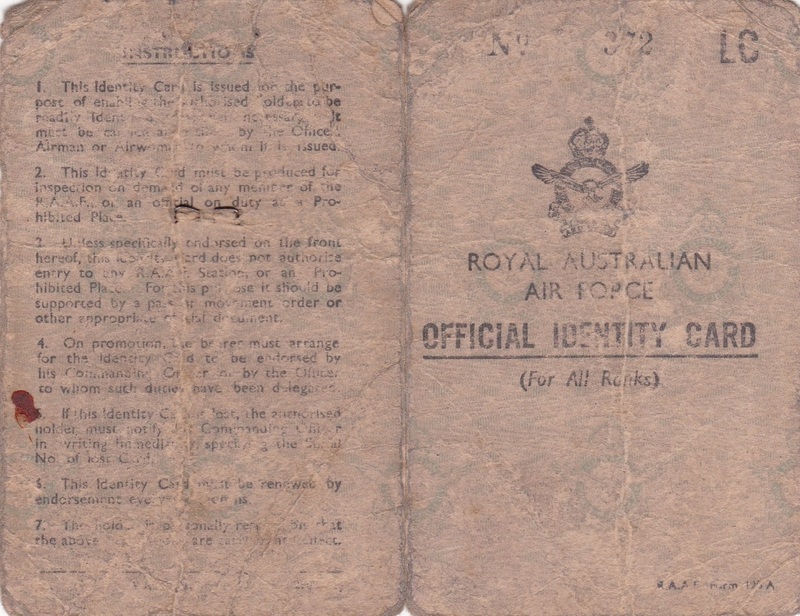 An Official Identity Card named to 126984 McDonough C. G. Charles Gerard McDonough enlisted on 16 Feb 1943 at Melbourne and discharged on 3 May 1946 from HQS Southern Area with the rank of Leading Aircraftsman. D184. 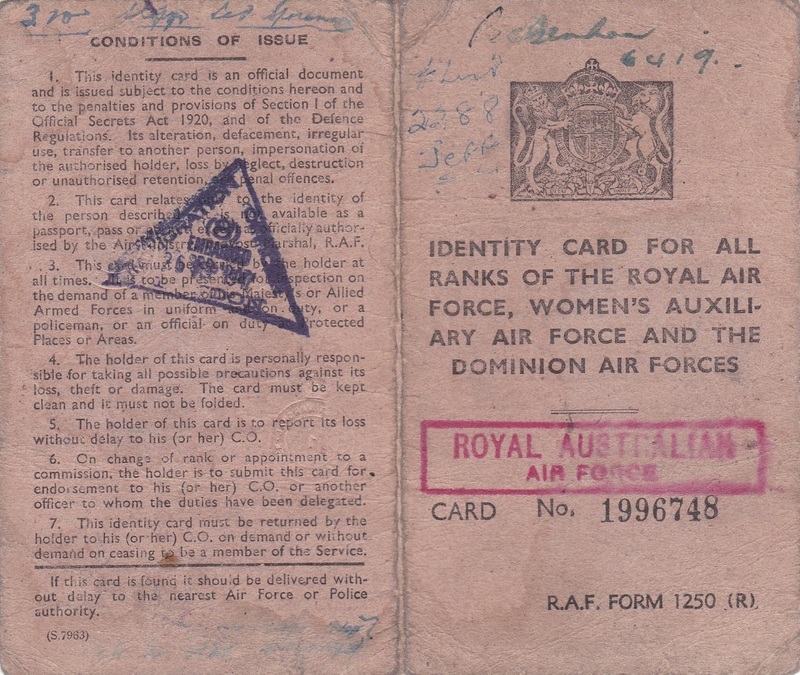 An Official Identity Card named to 36456 Dehon R. R. Ronald Reginald Dehon enlisted on 6 May 1941 at Sydney and discharged on 25 Sep 1945 from 1 Wireless and Gunnery School with the rank of Flight Sergeant. 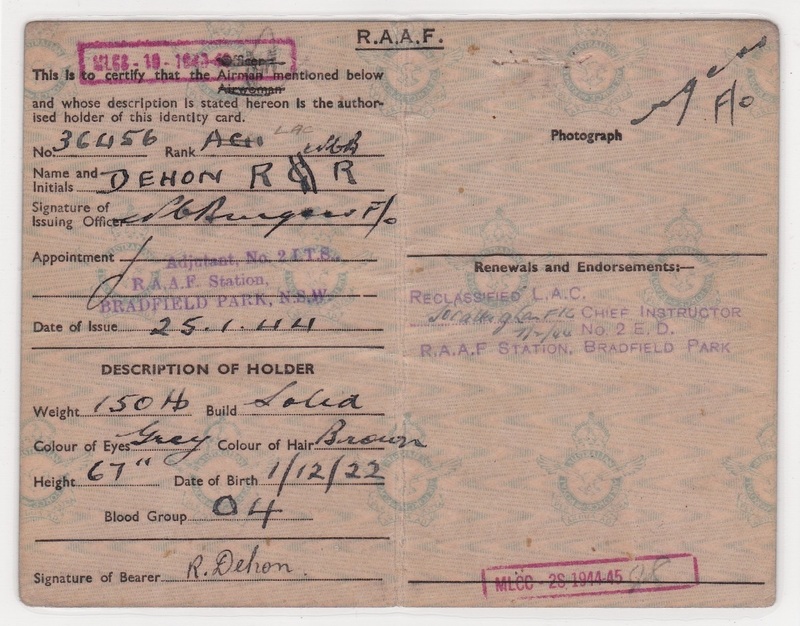 D246. 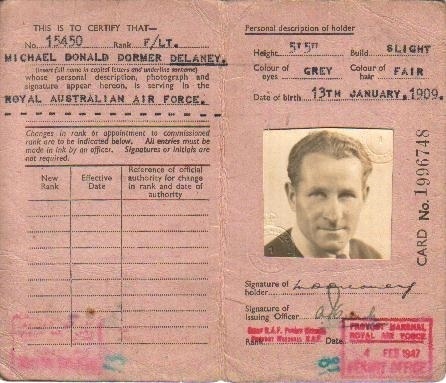 An Official RAF Identity Card named to 15450 Michael Donald Dormer Delaney. 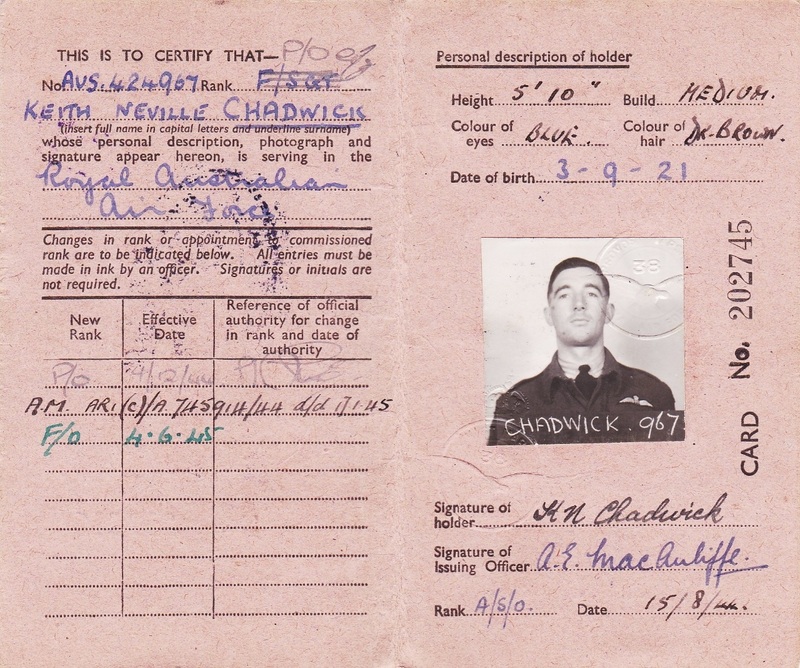 Michael enlisted on 2 Jun 1940 at Sydney and discharged on 31 Aug 1948 from Eastern Area Headquarters with the rank of Flight Lieutenant. D257. 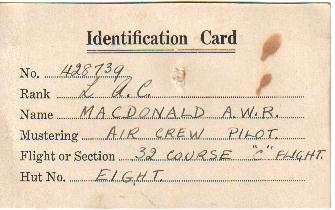 An Identification Card named to 428739 Macdonald A. W. R. Angus William Ronald Macdonald enlisted on 10 Oct 1942 at Sydney and discharged on 2 Jan 1946 from 2 Flying Boat Repair Depot with the rank of Leading Aircraftsman. D314. 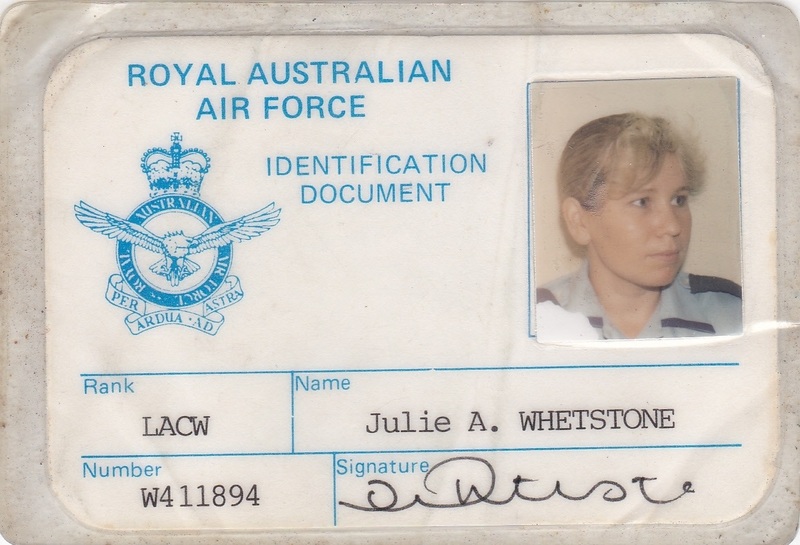 An Official Identification Card named to W411894 Julia A. Whetstone. 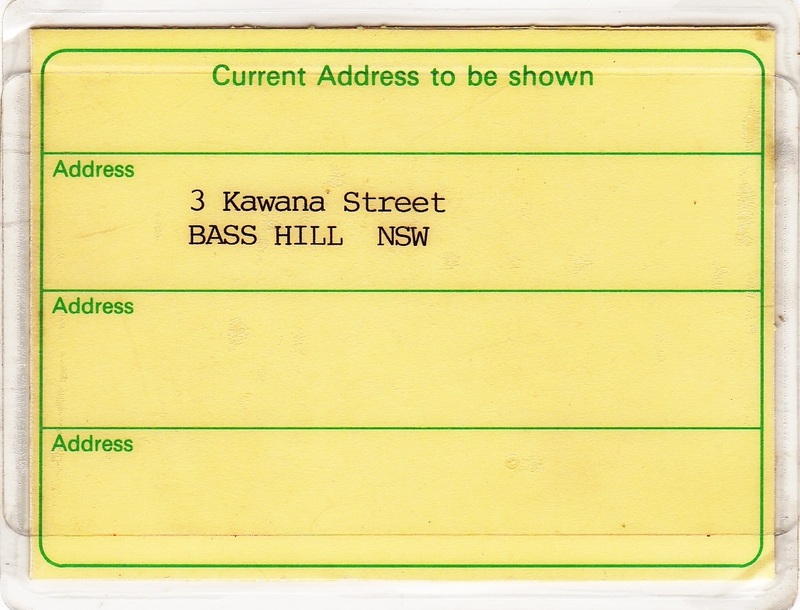 The card was valid until 23 Jan 1996. D322. 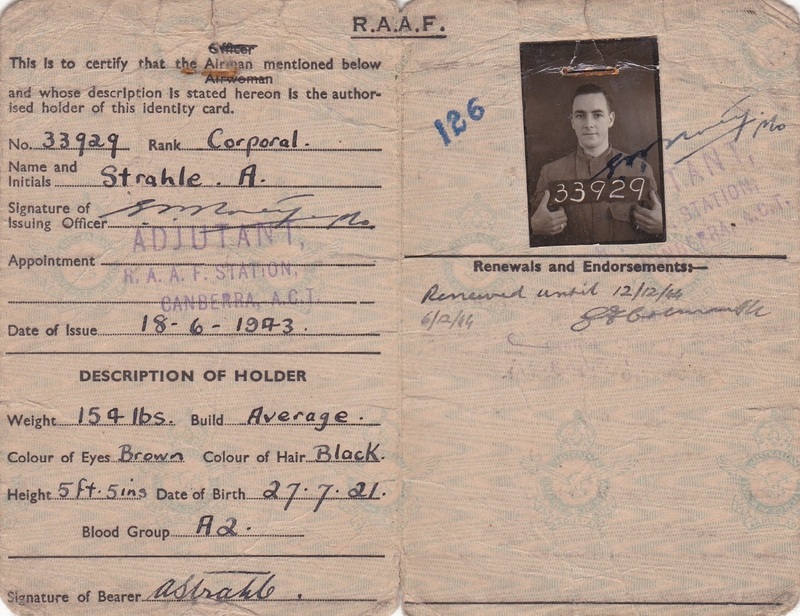 An Official Identity Card named to 33929 Strahle A. Arthur Andrew Strahle enlisted on 17 Sep 1940 at Sydney and discharged on 7 Dec 1945 from 5 Squadron with the rank of Corporal. 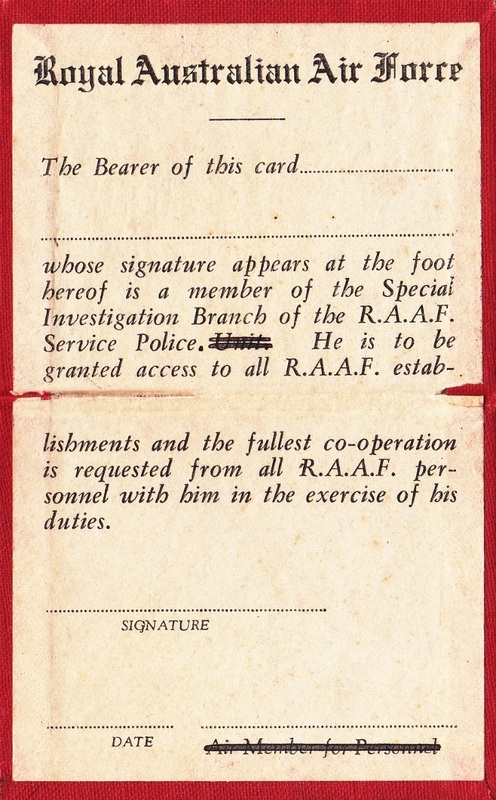 D462. 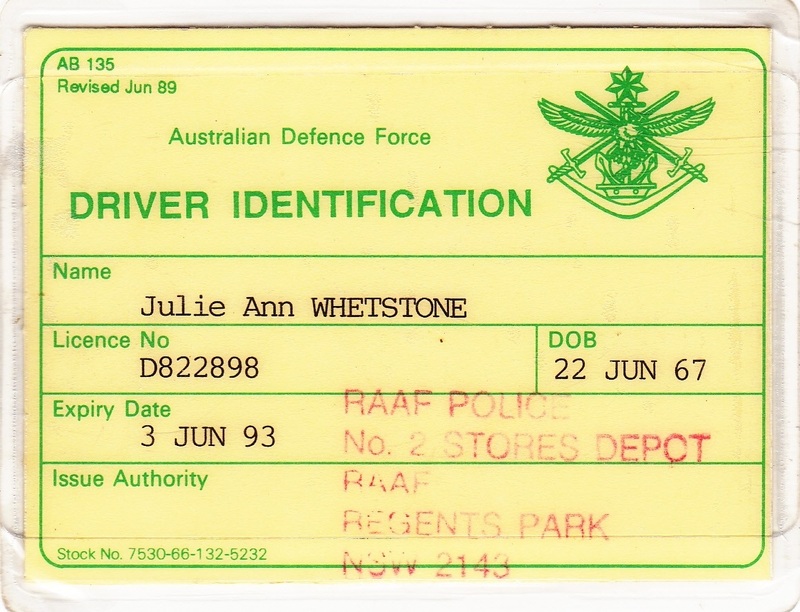 An Official Driver Identification card named to W411894 Julie Ann Whetstone. 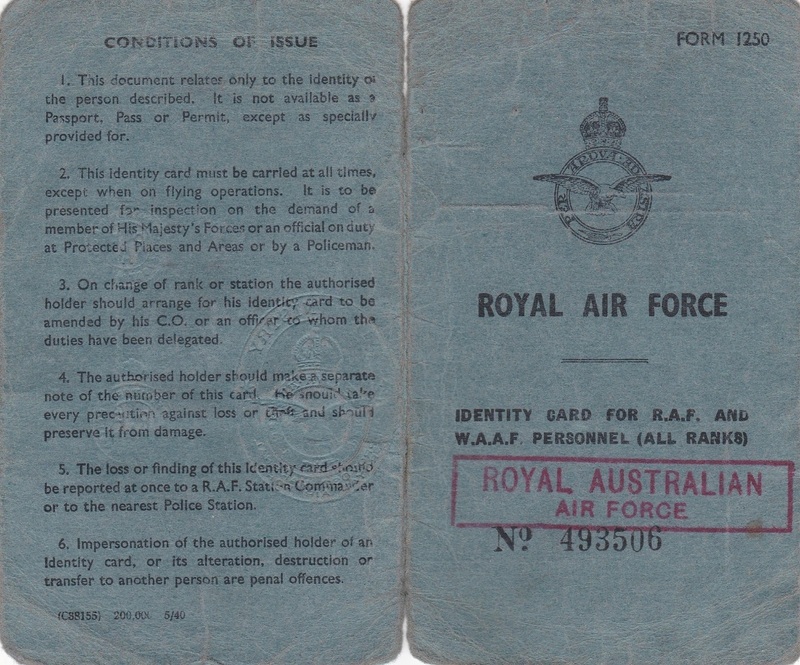 The card was valid until 3 Jun 1993. 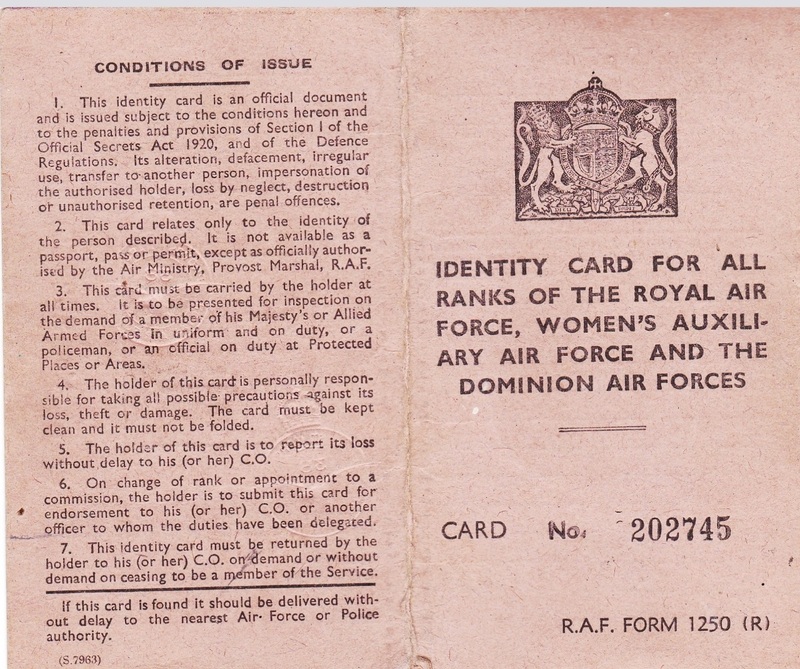 D558. 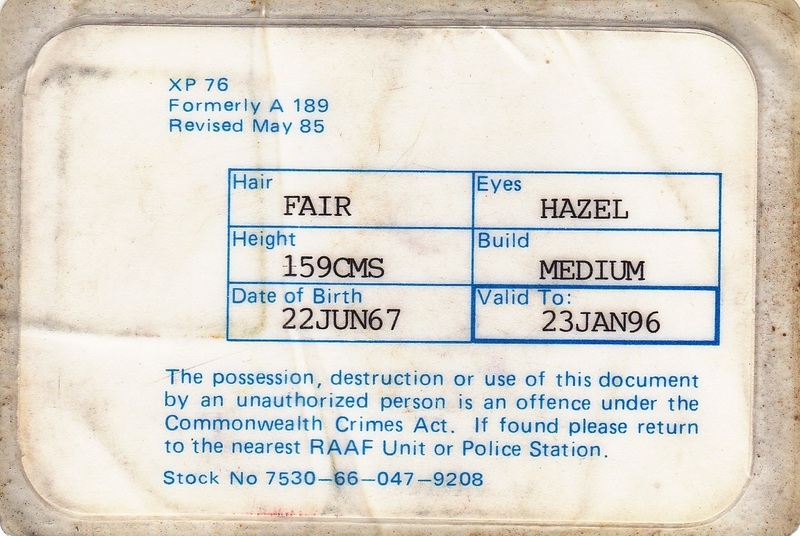 An unused Official Identity Card for a member of the Special Investigative Branch of the RAAF Service Police.